Welcome our new CQ DEV all-star, Space Ape and some awesome new Mods! As some of you may have noticed, the 5PG Team has acquired a new member (Hurray - I'm not the new kid anymore!). I’d like you all to give a big "Howdy!" to Space Ape! Space Ape, or as some of our Mods call him - LTD (late to dinner) is an experienced gamer, game designer, and community champion. I'm still your go-to for all things community, but you will also see Space Ape poking around in World Chat and posting updates in the forum. Whether or not you see him, he's always there behind the scenes, burning the midnight oil to ensure you have the best possible CQ experience. When you see these guys in WC, be sure to play nicely and offer them donuts. Last edited by LittleFury; May 4th, 2016, 11:00 PM. ....and a special hello to SPACE APE. I'm lucky to have known him through my most FAVORITEST game ever.... which unfortunately sunsetted a couple years ago. Space Ape was entrenched behind the scenes in that game, but seemed to be ever present and connected with the game's fans in the forums. He was a beloved unseen face with a cool ID in that game. So cool it should have been put on a card. Oh, wait. It was. Very excited to see an old DEV friend with lots of great ideas join Curio Quest! Hah! I can't believe you have an img of that card! That's awesome. 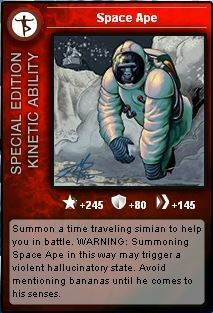 Spaceape needs to be a new skin for Geddon! That's a great idea! Remind me, if we ever do it, that I owe you a Space Ape skin. Hi everyone! Glad to be here. Really excited to be on this team and part of this game. We've got great things on the horizon. I'm a big fan of community and always welcome feedback. One of my goals is to make this a living breathing game. Some changes may be better then others, if that happens please be patient and together we'll find that happy middle ground.